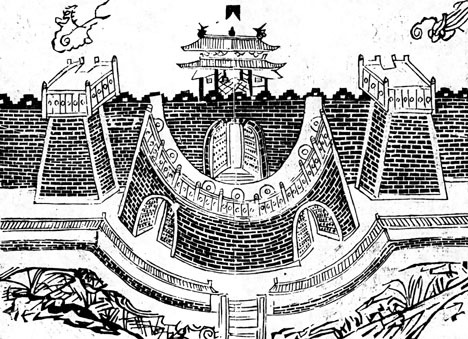 The Chinese have been building walls to defend cities since the Neolithic period. Walls were usually built with pounded earth, but often, in later periods, faced with brick. Can you identify defensive measures in the design of the "wall system" shown here? Are they similar to ones used in Europe of the period? In the picture above, notice the small wall immediately behind the moat. Known as a "sheep-horse" wall, it created a space in front of the main walls where animals could be corralled when the area around a city was evacuated. It was also another barrier to attacks. Cities isolated on a plain were less vulnerable than ones in rougher terrain, where the enemy would have more places to hide and rocks offered ammunition for catapults. When an attack seemed likely, one defensive measure was to evacuate nearby residents, both to protect them and to protect the city against the possibility that they might reveal information to enemy forces. 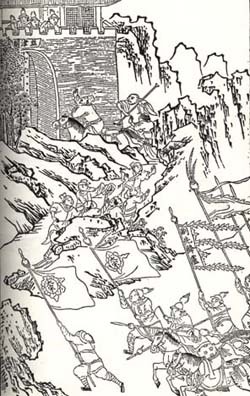 This illustration of the enemy attacking a fortification is from a novel, The Water Margin. What kinds of weapons do you think would have been the most effective in the circumstances depicted? Do you see them being used in this image? Defenders would also generally clear a space around the city to gain an open view of an approaching army's activities, and at the same time deny the enemy access to firewood, ammunition, or cover. This sometimes meant that the enemy would run out of food, firewood or fodder long before a well-stocked city would exhaust its supplies. 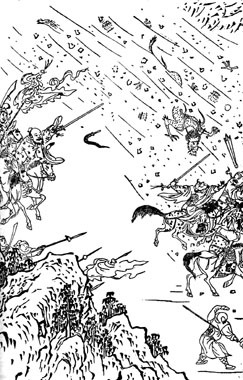 One of the ways to begin defending a city was to send out troops to attack an encroaching army before it got to the walls, as seen in the illustrations below from the novel, Romance of the Three Kingdoms. 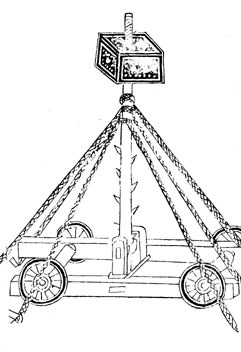 After a siege was well under way, garrisons often mounted sorties outside the walls to destroy enemy siege engines or supplies and raise morale within the city. After surrounding a city, attackers would begin by delivering leaflets via arrows to explain the consequences of resistance or the rewards to be given to those who surrendered. When that failed, as it usually did, the attackers would bombard the city with crossbows and catapults, then attempt to scale the walls. They would bring in equipment such as bridges, ladders, carts, and towers, many on wheels, to help in breaching the walls. The illustrations below show six types of tools from The Essentials of Military Arts and The Water Margin. From the pictures below, can you guess why city officials would have had plenty of time to prepare for the attack of an oncoming army? 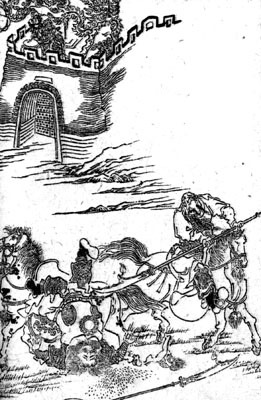 At left is a "cloud-ladder" from The Essentials of the Military Arts. 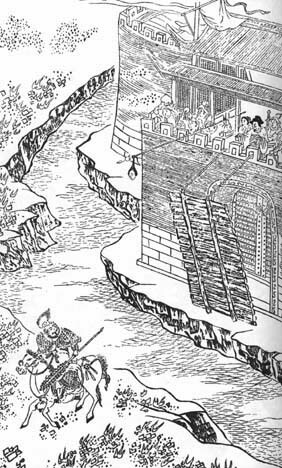 Scaling ladders were already being used in the Warring States period. Notice the helmets on the soldiers. 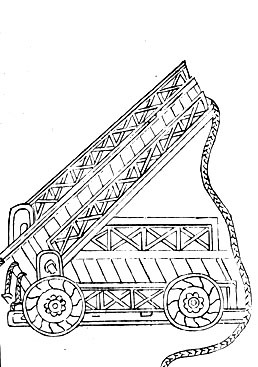 The "hang-over-the-sky" ladder shown at left was another version of scaling implement. Can you think of a way to counteract ladders like the ones at left and above? The "fork" cart to the right, another movable weapon, would have been used by the attackers to chop at the walls. 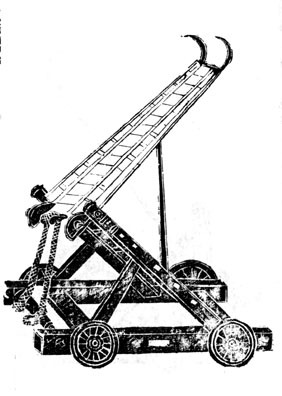 The pivoting beam terminating in long claws would sometimes have been attached to a long ladder for extra height. 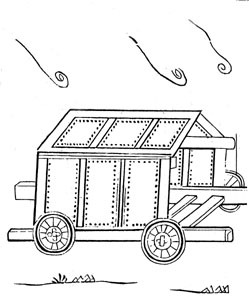 When a wall's integrity was breached, other implements such as "buildings in the void," "flying ladders" and "cloud ladders" would be moved into the holes thus created to allow invaders access beyond the walls. When the attacking side was close to the moat and the walled city, folding bridges could be used by both the attackers and the defenders. Why would an army bring their own bridges with them? To the right is a suspension bridge from The Water Margin. Can you see from the picture how the bridge would have worked? How vulnerable was it? Other types of bridges included revolving bridges, connected underground to a mechanism inside the gates. When the connecting pin was disengaged, the bridge would turn over and anyone on the bridge would fall into the moat. 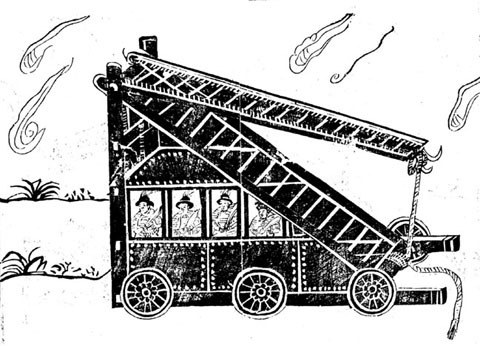 Below are a watch tower and a striking cart from The Essentials of the Military Arts. The three ropes on either side of the pole are attached to either side of the cart, keeping the pole upright. How do you imagine these were used? An early version of the tank, at the right, had a rigid spine and was covered like a tent with oxhide. It was designed to protect men as they were brought close to the wall. 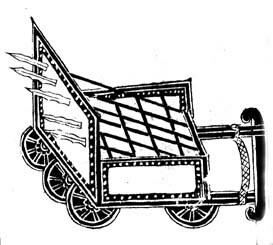 Incendiary arrows could be shot at the cart, but if the oxhide was fresh enough, it provided some protection. 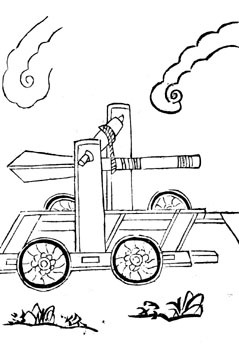 How do you think this tank would have been propelled? 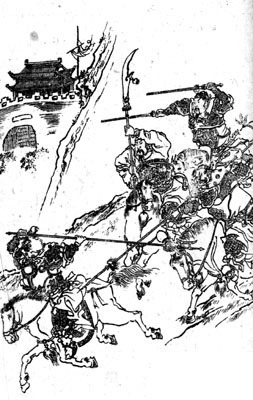 At left, an army that had approached a city's walls is bombarded by items dropped from above -- one of the major lines of defense. 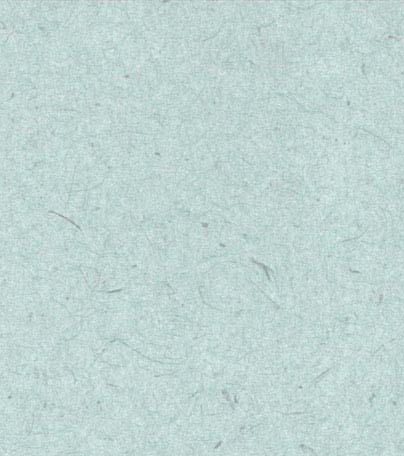 Can you identify some of the objects raining down -- especially after viewing the next sections? 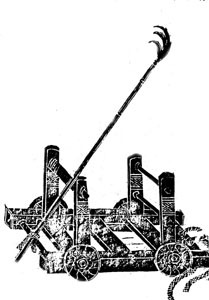 In the eventuality that the gates failed to hold, defenders would have implements such as the one on the right, a "knife cart for blocking up gates," to roll into place. When a city did fall, civilians were encouraged to flee, but soldiers were expected to stay and fight. The sack of a city was usually gruesome, with indiscriminate slaughter and desperate attempts to buy mercy.